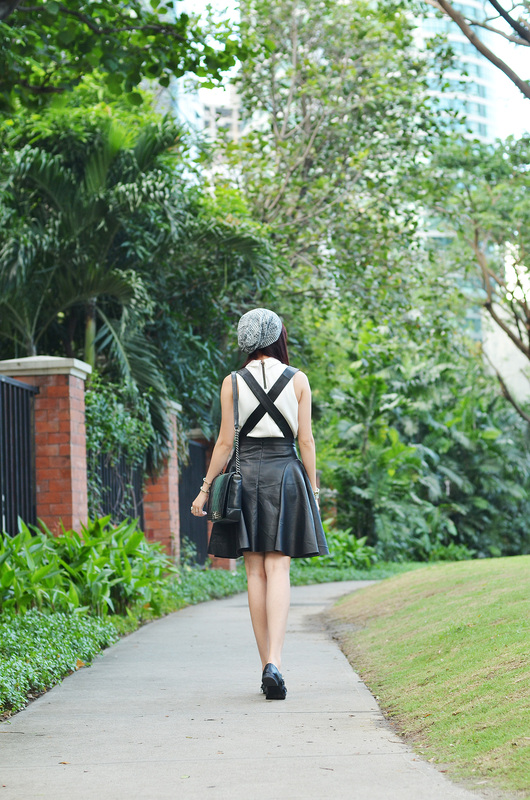 To those who miss my darker hair, let’s reminisce through this old outfit post I only got around to uploading now. That hair color did look its best with black and white ensembles. I think that’s why I wore so many of this color combination in the past months. This particular one is another favorite. I find the faux leather skirt so unique. Its straps are actually detachable so if you want to style it in a dressier way, you can just remove the straps. But for a more youthful look, make use of them like how I did. They add a different appeal to your entire look. Love that skirt. I miss your dark hair but I love light coloured hair too (I bleached my hair blonde haha). You look pretty kickass with any hair colour anyways. Are there any hair colours you haven’t tried but want to? Love your hat! You look like a hipster but the touch of feminine never swipes out! Cool! love the bag. :) i miss your dark hair :( Btw, i’m just curious did you try black as your hair color? Cute outfit! I am totally obsessed with leather and I think that skirt is really cute on you. very cute… love your hair color. I can’t resist saying it! #gossipgirl! What a look, Miss Camille! So Upper East Side! You could totally strut down the streets of New York and be chased by the style paparazzi. I find your edge here totally fearless. The suspenders part of your skirt really do make you look rebellious. The white top sets off your darker hair coloring, making the statement very worldly. I also noticed your skirt length is longer than your usual preference for a solid black piece. The dotted detail makes me wonder how effortlessly you apply your style to a timeless degree. P.S. Congratulations for your collaboration with Lenovo. I saw your latest creation. Your new hair looks AMAZING! Hi what’s your hair color here? Like a jumper but the straps are detachable :) Yes I do! hi! what’s your hair color? Can’t wait for you to blog about your trip! BOMBARD US WITH PHOTOS PLEASE! I am already loving the outfits you have worn! The velvet jacket and skirt! I LOVE! You have the smaller Chanel Boy Baaaag na rin! LOOOVE! Sana you got it in another color since you have the black na! Pero regardless, maganda parin naman sya! Did you buy it yourself? OMG! “All of Parmigiani’s leather straps are by #Hermes.” You got me at “Hermes” haha! Loooove the watch! Tell me you got one of those beauties! complimentary gift?! SOOO BONGGA! Awwww I didn’t :( I wish I had though! It’s in dark blue and I heart it haha! And yes, I bought it there :) Thanks Tasha! I will bombard everyone with photos, don’t you worry. i voted u here http://www.stylebible.ph/best-of-2013/blogger/ many many many many times…i hope u win…!!!! Aww thanks Ai-Ai! All the others are so good though! PS: I may miss your darker hair sometimes but your copper colored one right now looks so good on you too. OMG, that BAG. I love, love, love it. I love your hair and your outfit. It really suits you. Awesome skirt! And oh how I love that bag! Great colour you have! I LOVE THIS! Camille! Where did you get your mala-Celine ID Bracelet? I like the colour of your hair, it makes you look so fragile! Sobrang cute nung skirt! Question lang, pwede ba i-iron yung ganyang fabric?